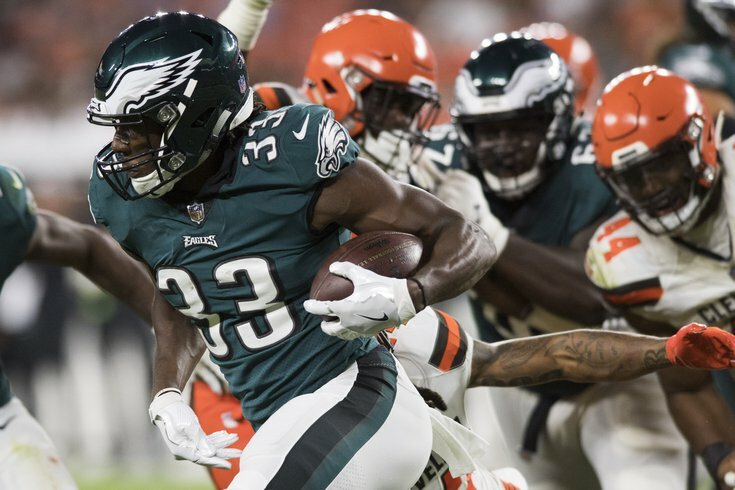 Philadelphia Eagles running back Josh Adams runs with the ball during the second half against the Cleveland Browns. Yes, we're predicting the Philadelphia Eagles' practice squad, because why not. With 32 NFL teams making their final cuts on Saturday, any player who is not a vested veteran will be subject to waivers, and can be claimed by other teams around the league. Those players will join their new team's 53-man roster. • QB Connor Cook: Cook was part of the 2016 draft class that included past and present Eagles Carson Wentz (second overall pick), Nate Sudfeld (sixth round), Christian Hackenberg (second round), and Joe Callahan (UDFA). The Eagles surely did extensive work on Cook leading up to the 2016 draft, where he was taken by the Raiders in the fourth round (100th overall). Last offseason, the Eagles found what looks like a practice squad success story in Sudfeld. I think they'll try that approach again, and at 6'4, 220, Cook fits the profile of a bigger quarterback that the Eagles seem to prefer. • RB Josh Adams: There's some thinking that Adams will be claimed by some team on waivers. Meh. I'm not so sure about that, as Adams didn't really show that much during the preseason games, and has struggled staying healthy. I think the Eagles would like to retain Adams on the practice squad, should he clear waivers. • WR Rashard Davis: Davis was on the practice squad last year as well, and showed year-over-year improvement, making several plays down the field in the preseason games, and showing some shifty running ability after the catch from the slot in training camp. • TE Blake Bell: I think the Eagles would like to add a tight end to the practice squad, and I think they'd like to upgrade from Billy Brown there. Bell is a former college quarterback at Oklahoma who converted to tight end. In three NFL seasons, Bell has 22 catches for 290 yards and no TDs. He's 6'6, 252, and has some athletic traits worth developing. Another interesting name that became available is Clive Walford, a former third round pick of the Raiders. • OT Toby Weathersby: Weathersby had some decent moments during training camp, and the team should look to add him to the practice squad. Derp. Weathersby was waived/injured. I'm terrible. Let's go ahead and add LB Kyle Wilson instead. Ugh. Black mark on my career. • DT Aziz Shittu: Doug Pederson specifically mentioned Shittu multiple times for having a good offseason. • DT Elijah Qualls: Qualls was a sixth-round draft pick a year ago, so if he's not claimed, I imagine the Eagles would like to have him back. • CB De'Vante Bausby: Jim Schwartz said that the team felt confident bringing Bausby up from the practice squad to play if multiple corners went down last year, but aside from Ronald Darby missing 10 games, the Eagles stayed relatively healthy there. I suspect they'll find some comfort in familiarity in Bausby, and they'll add him to the practice squad once again, if possible. • CB Chandon Sullivan: Sullivan had a very good preseason, and put himself in the conversation to make the final 53. He's a great candidate for the practice squad if he makes it through waivers. Thank you for indulging me in this waste of time.